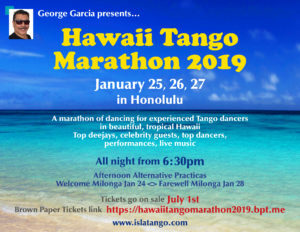 Join us at our Hawaii Tango Marathon 2019 – January 25, 26, and 27. A marathon of dancing for experienced Argentine Tango dancers … in beautiful tropical Hawaii. Click the the Hawaii Tango Marathon tab above for more information – accommodations, transportation, and travel tips. Early Bird tickets are available now! Click the image below. Payment is through PayPal but a PayPal account is not needed. You will be able to check out as a guest. 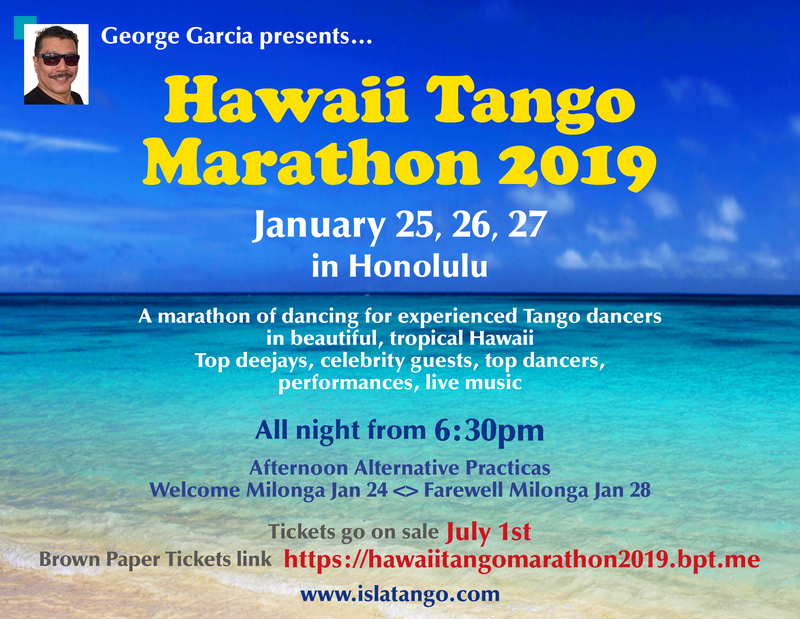 Offering lessons from renowned teacher, George Garcia, IslaTango was founded in 1997 and is the longest established and most influential tango source in the mid-Pacific area. Our students have developed the proper skills to confidently dance in any milonga, anywhere on the planet. Tango for Absolute Beginners: A four-week series that starts on the first Wednesday of each month. “If you can walk… you can learn to tango” with expert instruction from maestro George Garcia. Class meets on the first four Wednesdays of the month at 7:30-8:30pm with a 2-hour practice session included. See Lessons page for details. Would you like to take your tango to a higher level? George offers private coaching that gives immediate and long term results for both leader or follower. Learn out how to create that ‘Lush Connection’ that partners find irresistible. Maestro George Garcia teaches traditional elements for the leader and follower by establishing a tango vocabulary for the student that combines logical movements with strong musical connection with one’s partner. Dance Vision is currently offering a closeout sale on all DVDs. Get yours before they’re gone.